Corpus Christi College Cambridge report with great sadness the death of Oliver Rackham OBE MA PhD FBA, on 12 February 2015, aged 75 years. Professor of Historical Ecology, Botanist, Master of the College 2007-8, Fellow of the College 1964-2007 and 2008-2010, Honorary Fellow 2008-2015 and Life Fellow 2010-2015, Oliver Rackham was an extraordinary man and an extraordinary academic. Oliver Rackham studied and wrote with great eloquence, vividness and originality on the British Countryside and especially on trees and woodland. My copies of the History of the Countryside (1986) and Trees and Woodland in the British Landscape (1976) are still regularly consulted. He also studied and published extensively on the ecology of Crete in Greece. I met him properly just once, in 2005, when he agreed to give a plenary lecture on mountains and ecological history at my European conference on Biodiversity Conservation and Sustainable Development in Mountain Areas of Europe, held in the lovely Greek town of Ioannina, Epirus, Greece. I guess the lure of a free trip to Greece must have influenced his decision, he didn’t know me from Adam, but my conference and my young research students were all the better for his presence and there are many fond memories. Before the conference I recall all flights were delayed, due to some disturbance or other, and Oliver Rackham was brought to us from the airport by taxi. On arrival at the conference venue it was clear that the accompanying passengers were rather shell-shocked, and they recounted, over a stiff drink or two, that Oliver Rackham had been completely oblivious to the extraordinary speed with which the Greek taxi driver had navigated the winding roads up to the mountain destination, but rather had been leaning out of the window exclaiming excitedly on aspects of the ecology of the landscape as they hurtled past! 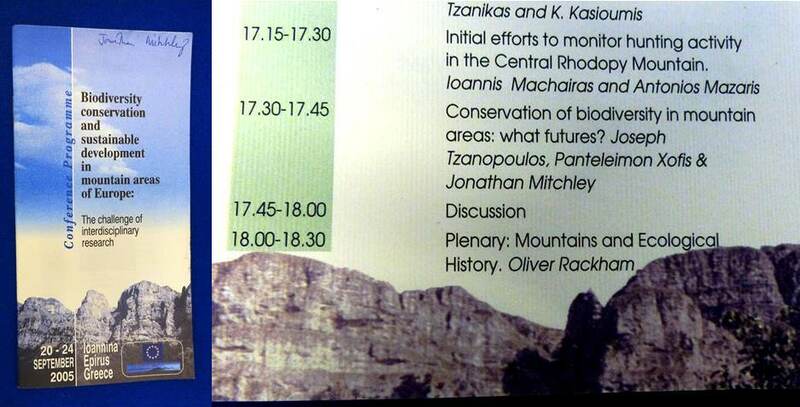 And once the conference was underway I still recall the puzzlement of our Greek organising committee who had to root around in the basement for a traditional slide projector for his talk as he simply did not do technology and certainly not PowerPoint! Furthermore, his lecture overran quite significantly, but there was no way anyone was going to interrupt the great man and of course we let him continue with his flow of narrative eloquence until he had exhausted all his slides and had said all he wanted to say. They certainly don’t make them like Oliver Rackham anymore and we can only regret his passing but long may his memory and his published legacy remain. I have fond memories of Oliver.He regularly visited our family while researching Bradfield Woods. My mother accompanied him to the palace when he received his OBE. One of a kind for sure.